← Did He smile to see His work? It was interesting to read this week that Rory McIlroy, the world’s number one golfer, refers to his meltdown on the last day of the Masters in 2011 as ‘the most important day of his career.’ Too often in sport, people can concentrate on when things go right as ‘defining’. Yet, perhaps obviously, it is when life goes wrong that we learn most about ourselves, other people and the sport to which we are dedicated. Luke Baldwin cuts an uneasy figure. One who has been through a fair amount this last year. He sits opposite me at the table, wanting to put a side of the story across which he feels hasn’t been aired. His departure from Bristol, in light of his announcement to sign for Worcester next season, was quick. He felt he had to write an open letter to the fans, whom he describes as some of the best he’s played in front of, but that didn’t really say what he wanted it to. He’s not remorseful about the manner of his departure and in fact understands why certain things had to be done. And he doesn’t resent his time with Bristol, but then again, he doesn’t strike you as the type of chap to regret too much. Baldwin is honest, almost to the point of seeming naive at times. But then comes a maturity and positivity that you can’t help admire. An ambition to want to work hard and do his best, accept what he can’t change but ultimately, just be given a chance. He speaks with a frankness that is a little unusual in a professional sportsman. Baldwin left Saracens and Bedford, the team he was on loan with from the Barnet outfit, half way through the 2013/14 season. A call from the southwest and the opportunity to have a tilt at the Premiership was too good to refuse. 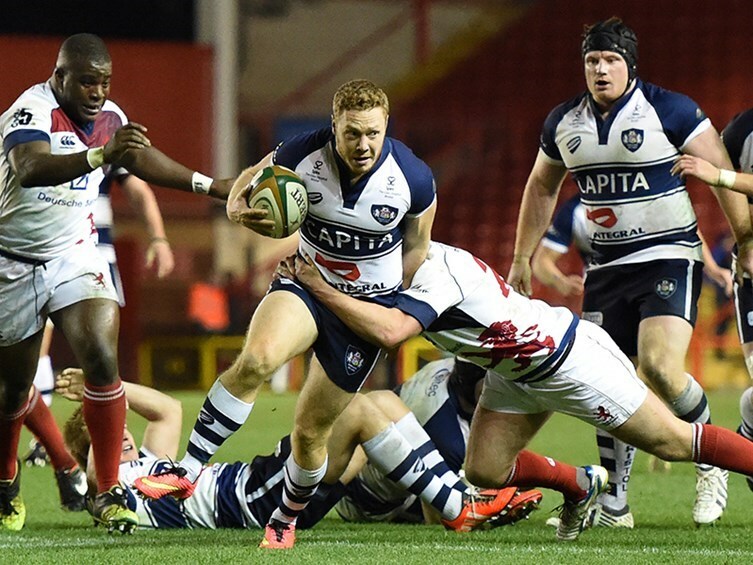 Bristol missed out on promotion, losing both legs of the play-off final against London Welsh, a side who have subsequently and ignominiously achieved just one try scoring bonus point in the top flight this season. I ask him about how his time at Bristol was different to that of Saracens, after all he’d played third or fourth fiddle there? I ask him about telling Andy Robinson that he wanted to leave. Did you tell him you had an offer from Worcester? Bristol have a very good chance of playing Premiership rugby next year, but by moving to Worcester you feel their chance is stronger? What of Bristol should they not get promoted? Mr Lansdown has deep pockets but surely the goal is Premiership Rugby and if this isn’t attained again, questions will have to be asked won’t they? But haven’t you got to think like a Premiership side to get into the Premiership? So the fit was wrong for you at Bristol, what have you learnt about yourself? Baldwin is still young enough to make a big name for himself in the sport. And you can only hope that his next step does allow him the chance he deserves. He speaks like a man wounded by circumstance, rueful of the bruises but desperate to try and make the best out of a bad position. Young players coming into the game may get a little blinded by stories where professionals have had things work out for them. Too often, the opposite is true. How we react to those situations is perhaps a better measure of what we can achieve in sport. Accepting where you’ve gone wrong takes courage and making sure you don’t make the same mistake again, takes wisdom. And the wiser we get, the more discomfort we have to endure. But as McIlroy himself will tell you: no pain, no green jacket. This entry was posted in golf, rugby, Sport and tagged bristol rugby, greene king ipa championship, Luke Baldwin, worcester warriors. Bookmark the permalink. We hope to see you again Luke. Onward and Upwards. I too have my concerns about the arrogance of Bristol, I saw the posters around the City. It is my home town and it would have given me great pleasure to see them succeed from their true home the Memorial Ground. I need to be convinced by the new Bristol and perhaps even more so by AR. I wish Luke all the success he deserves, once a Blue always a Blue. We look forward to seeing Luke at Worcester. Comments regarding Bristol management’s perceived attitude to other clubs in the Championship fit with views expressed recently when we visited Jersey RFC – their extremely welcoming supporters clearly held no fond memories of AR and his public utterances at the time of their visit. Was pushed down to third choice by Craig Hampson, who is 6 weeks younger than Baldwin. Hardly fits his theory does it? Was always going to be behind Peel, but chose to move on rather than compete against Hampson for the 2nd spot.